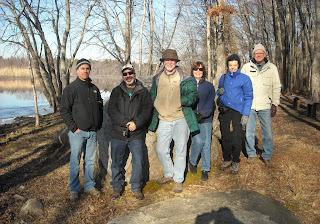 Stewards Dan Hurwitz and Yan Thomas (taking photo), Paul Marcus (Trails Committee), Arthur Hildreth, Linda Kovitch, and Ron & Carol Reynolds went on a very pleasant Saturday trail walk (Jan 7th) to the Altmann conservation area and the Brothers Rocks (pictured). Every month on the first Saturday meet behind the library at 9:45 am rain or shine to walk one of Bedford's conservation areas. Sponsored by the Trails Committee.